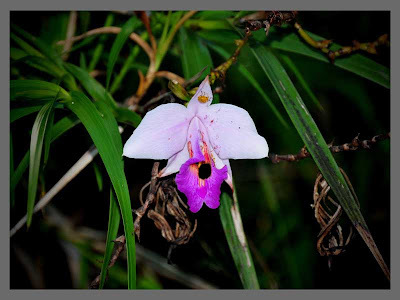 The bamboo orchid (Arundina graminifolia; syn. Arundina bambusifolia Lindl., Arundina speciosa Blume, Bletia graminifolia D.Don) is a species of orchid and the sole of the genus Arundina. This tropical Asiatic genus extends from India, Nepal,Thailand, Malaysia, Singapore, South China to Indonesia and across the Pacific Islands. It has been introduced in Puerto Rico, Costa Rica, Panama and Hawaii. This orchid blooms in summer and autumn, showing rather open clusters of showy terminal flowers, ten at the most. They bloom in succession on the terminal racemes, which are 7 to 16 cm long. These flowers, 5 – 8 cm in diameter, are a rosy lilac and white disk with a purple lip. The bracts are wide triangular and surround the main stalk of the flower cluster. The occasional fertilized seed pods contain minute powdery seeds, and small plants often develop near the cane ends after flowering, and likely aid in propagation if allowed to reach the soil.